What all the calligraphy styles and schools set in various cultural realities have in common? 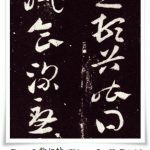 How do we “read” the calligraphy? How do we relate to that black maze of undecipherable lines, and how can we hear what the ink is whispering to our soul? 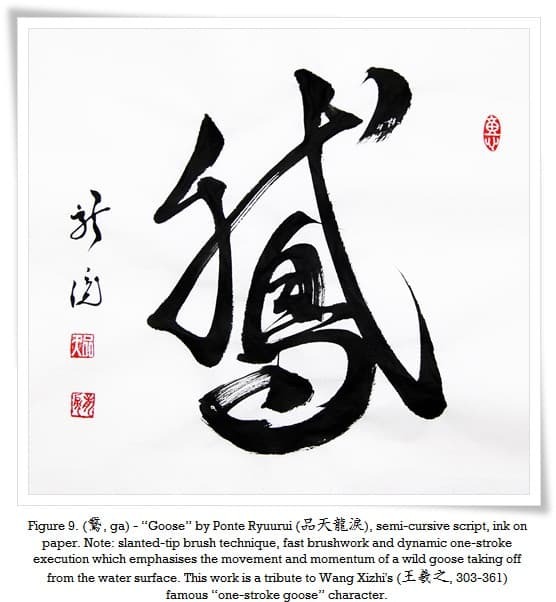 There are five basic elements which calligraphy should possess. If one of those elements is missing, the whole work will be lifeless and dull. The brushwork is determined by the way a calligrapher operates his brush. Since the brush is considered the extension of calligrapher’s soul, it also tells us a lot about how he or she expresses the feelings. There are two major brush techniques; one is called centred-tip brush (蔵鋒, pinyin: cáng fēng – “hidden spear (of the brush tip)”), and the other – slanted-tip brush (露鋒, pinyin lú fēng – “revealed spear (of the brush tip)”). Centred-tip brush technique is based on the brush tip being led in the centre of the stroke during writing. It delivers a “round line”, locking the energy inside the stroke. This technique empowers the lines, and makes them appear vigorous yet sound. The slanted-tip brush technique is based on the brush being operated at a slight angle to the paper surface, so then the brush tip is “visible” or “exposed”, as it runs along the edge of the stroke. This technique delivers more aggressive lines, which are full of movement and kinetic energy. Brushwork depends on personality, as well as desired effect. Skilful application of ink may produce various effects. It comes along with knowledge of the brush, ink, inkstone and paper (i.e. The Four Treasures of The Study ). Blur, dry ink, wet ink, kasure (掠れ,かすれ, streaks of white within a stroke where either ink is insufficient, or the brush movement was faster than ink spreading ability), etc, are all ink application techniques. They create colourful moods and images. It takes years and years of practice to be able to feel how all four treasures will complement one another. Construction of the characters goes back to the theory of “bones”, “muscles”, “flesh” and “blood” (I will explain these in a separate post, but basically those terms refer to the line qualities within the character, such as thickness ratio, balance, etc. ), and it has a lot in common with the brush technique and ink application. Characters in calligraphy have to appear alive, preserving the mind of the artist, and they need to be expressive enough to be able to tell a story that will last throughout millennia, a story communicative enough to reach the next generations. Composition is a reference to the layout of the calligraphy as a whole on the paper, i.e. the relation between the characters, the signature, and the seals (I will be writing about those in a separate post). One needs to realise, that the beauty of calligraphy is hidden mostly in the white space of the paper sheet, and not in the ink strokes. In other words, it is the white space that defines the beauty of strokes. Therefore, the layout is crucial for the energy to flow freely within the work (it is also known as 行気, ぎょうき, gyōki, i.e. “moving spirit”). To many readers it may appear quite tricky to visualise, but I will try to explain in greater details in my future posts. 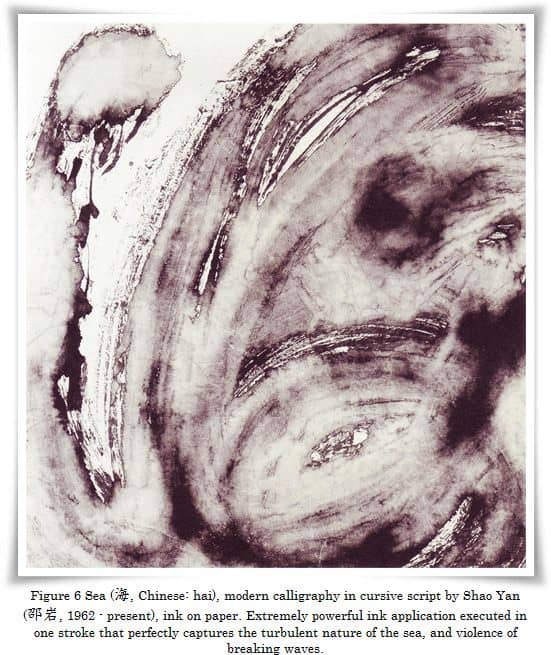 Lastly, the rhythm is achieved by the brushwork, ink application and the mood of the calligrapher. The meaning of the phrase itself may influence it further. The rhythm brings vigour, and pours life into the calligraphy. 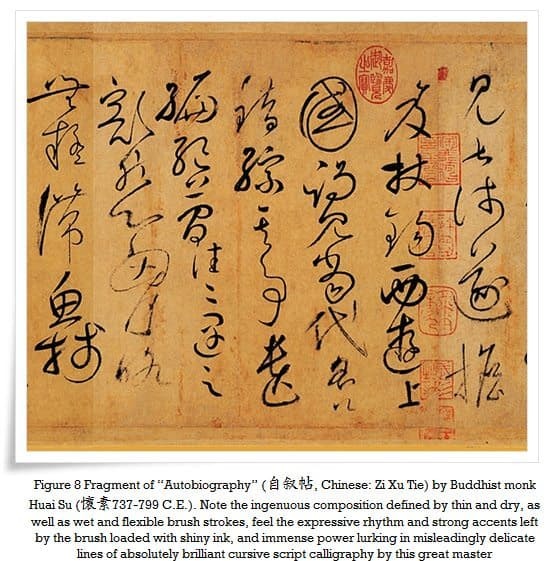 It is especially visible in works written in cursive script, such as “Autobiography” attributed to 懷素 (Huái Sù, 737-799) of the Tang dynasty (唐朝, 618 – 907). The brush rushes through the sheet, and then slows down to take a breath. It emphasizes artist’s emotions in some places and drops the pace in others. Yes, it is exactly like music. The five elements of the calligraphy define the style of a calligrapher, his skill, artistic sense, personal sensibility and knowledge of the art. In Japanese we refer to it as shofuu (書風, しょふう, shofū, “(one’s personal) writing style”). 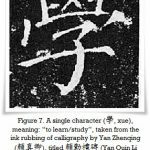 To be able to read calligraphy, you will have to feel it (not necessarily you have to be able to read the Chinese characters). Calligraphy is written on the paper of imagination, with a brush that is an extension of the calligrapher’s soul, a brush that is dipped in the ink of contents of his passion, which is rubbed on the inkstone of solid skill and knowledge. Read the calligraphy in the same way as it was written – with respect and feelings. Only then the black ink strokes will whisper you their secrets. Thanks a lot Robin, I really appreciate your kind words. The ga ga part made me chuckle. But it is true, difficult to fly with a big ego, is it not. Calligraphy teaches us humility and respect, and the history shows us that even those whose style was good and writing was strong, if their character was not upright, they were forgotten. You have pointed out a very important detail – the presumed connected stroke. Both, the presumed one and the actually connected strokes, are called 連綿体 Japanese, and I wrote a separate article where I discuss this issue. 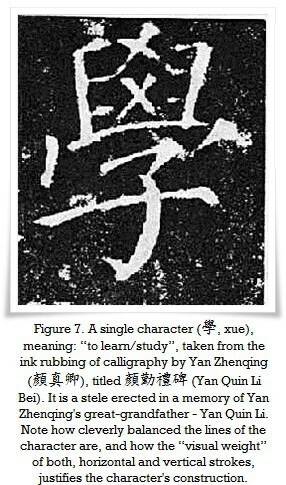 I am providing a link here: https://beyond-calligraphy.com/2011/07/02/importance-of-the-stroke-order-in-writing-chinese-characters/ You say you were corresponding with 白川 静? He is a great inspiration to me, I am currently researching his books and write a series of posts on the etymology of Chinese characters. If you have the time, please have a look and let me have your thoughts. You will find them under the “etymology” menu tab. Thanks, Ryū.